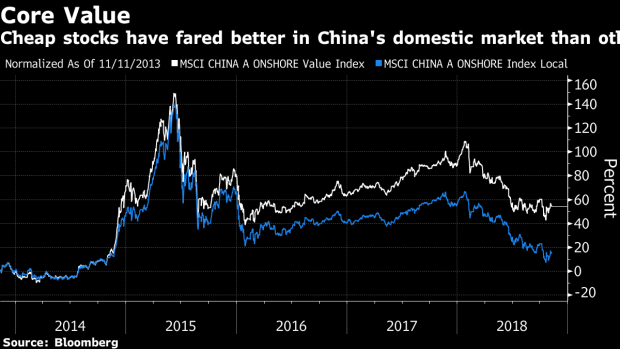 (Bloomberg) -- A classic investing strategy favored by the likes of Warren Buffett and Benjamin Graham is paying off for investors in mainland China, in contrast to many other parts of the world where it’s misfired for much of the past decade. Stocks trading on low price-to-book ratios in Shanghai and Shenzhen were the best-performing bets in Chinese equities in October -- a rally that still has legs, according to UBS Group AG quantitative strategists. “Value has performed quite consistently,” Shanle Wu, an Asia-Pacific quantitative analyst for at UBS Investment Research, said in a telephone interview on Wednesday. “Looking at the past decade in China, it’s one of the best performing factors,” she said. Picking cheap shares has fallen out of favor as an investment strategy globally in recent years after they failed to keep pace with growth stocks such as the so-called FANGs -- Facebook Inc., Amazon.com Inc., Netflix Inc., and Google parent Alphabet Inc. But in China, investors are better off with less-flashy names, Wu said. Among UBS’s picks: Metallurgical Corporation of China, which trades on a 9.49 forward price-to-earnings ratio, and Shanxi Taigang Stainless Steel Co., with a 4.81 multiple. Its model also tips China Railway Group, which builds train lines, tunnels and bridges, and carries a 9.07 multiple. By comparison, the CSI 300 Index trades on 11.17 times earnings. A strategy composed of buying the cheapest stocks and shorting the most expensive in the CSI 300 Index rose by 6.8 percent in China’s domestic market during October, compared with a drop of 8.3 percent for the CSI 300, according to data compiled by Bloomberg. The same strategy also worked in the U.S. last month, gaining 6.2 percent even as the S&P 500 fell 6.9 percent. On a year-to-date basis, picking stocks for value in this manner has generated a return of 12.8 percent in China -- but has lost 12.6 percent in the U.S. and has been the worst-performing style factor this year, the data show.